Come out on Tuesday, May 1st at 7:30PM to cheer on the Crimson as they play UCLA in Harvard’s first-ever postseason tournament appearance. The winner will play No. 2 seed BYU on Thursday, May 3rd. 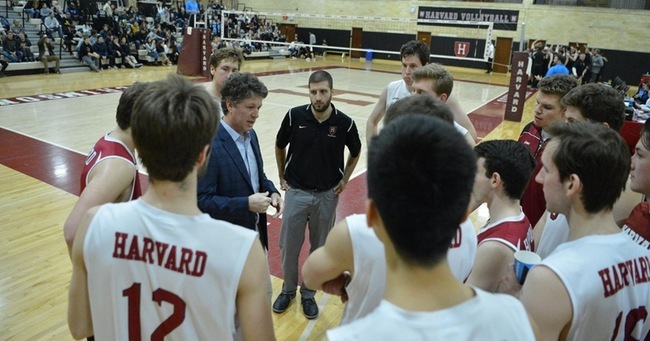 Qualifying for postseason play for the first time in program history, the Harvard men's volleyball team (13-13, 10-4 EIVA) has been selected to face UCLA (24-7) in the opening round of the 2018 NCAA Men's Volleyball Tournament, as announced by the league at the NCAA Selection Show today, April 22. The Crimson will travel to face the Bruins at UCLA on Tuesday, May 1 at 7:30PM. Harvard earned an automatic bid to the NCAA Tournament after defeating Princeton, 3-1, in the 2018 EIVA Championship on April 21st, to secure its first EIVA Championship title in program history. This is the first time in EIVA history that two Ivy institutions have competed against each other in the finals. The Crimson first advanced to the championship match after taking down Penn State in five sets in the semifinal round, qualifying for the finals for only the second time in program history. Harvard and UCLA have met once in program history as the Bruins topped the Crimson last season, 3-0. The winner of the match will go on to face No. 2 seed BYU in the semifinal round, Thursday, May 3rd at 7:30PM. Register: Click here to register directly through UCLA's website. Pauley Pavilion Security Policy – Clear Bag Policy: UCLA has a Clear Bag Policy that limits the size and type of bags that may be brought into the arena. Large purses or backpacks are NOT ALLOWED, but can be checked at a booth next to Pauley prior to entrance. Please see the links below for more info.